LSI. Sounds like a new term? Keep on rolling. Latent Semantic Indexing (LSI) is a part of the Google algorithm. Knowing about it and implementing it as a part of your SEO strategy is crucial. This post presents you the concept in an easily understandable way. Definition, “LSI keywords (also known as semantic keywords) are the related keywords to the main keyword. Many of the search engines like Google use it to decide the link between different entities of the web content.” It helps Google get the meaning of the written content. It also deals with search relevancy. Including LSI keywords with main keywords is SEO friendly. In earlier days, search engines used exact search query to get results. With this, search engines were not giving accurate results. Now, search engines analyze the meanings of the search queries. The content synonymically linked to the search query, are also returned. Google mainly carried out this to fight spammers trying to cheat the search engine by using keyword stuffing. The main power of Latent Semantic Indexing is its ability to expect related words while dealing with a particular topic. When it comes across unrelated words to the topic. In those cases, it considers the content is spun. The idea of LSI may be not clear to you now, keep on reading. 1 What are LSI keywords? 2 What is Latent Semantic Indexing? 3 How to Find LSI keywords? 5 How to use LSI keywords for SEO? LSI keywords are the keywords that are semantically related to the keyword you are searching for. This is done possible by Google making use of Latent Semantic Indexing. Have you ever wondered how Google and other search engines differentiate between homonyms (same word with different meanings)? Let me take an example. Search for “ps picture size”. Google highlights the words “picture, photo, image”. Sometimes the synonyms highlighted in SERPs are also called Synonymous LSI Keywords (sLSI). Now you got a clear idea what are LSI keywords. The term “PS” has different meanings in Google like PlayStation, Photoshop, and so on. Google gets results based on the keywords you have used after the term “PS”. Consider an example, where I search for “ps image size”. Google comes to know that the term “ps” in this context refers to Photoshop. Because I have used “image size” in front of it. Now Google searches all the content containing the terms Photoshop and image size, both. By doing this, it can get what the user is trying to search. This is a part of Google’s LSI algorithm. Here once I append the word “fps” to the “ps” keyword. Google easily made out that I’m talking about either first-person-shooter games or the frames-per-second in PlayStation devices. So, you now know that the FPS is a semantically related keyword to PlayStation. Google determines the meaning of the content by looking at the other semantic keywords that appear along with the base keyword and establish a relation among them. Including semantically related or synonyms of the main keyword, along with the main keyword in your articles or blog posts, gives a ranking boost. It helps Google in determining the meaning of the written content to some extent by analyzing the relationships between the entities or keywords in the content. If Google understands your content better, better is the rankings. How about this? Google is confident of taking the risk of showing the semantic result of SEJ straightaway. Because SEJ is a trusted site and the article is semantically rich in terms of Google. So now you might be thinking, how to create content that is easily understandable by Google. The answer is: Including related synonyms or semantic keywords along with the main keyword. However, merely including semantic keywords in a site or blog that has no authority or backlinks doesn’t work. But it does boost rankings. LSI algorithm helps Google to understand the content on the web page like we humans do, and match it with the search queries of the user. This results in more accurate search results for the queries of the users. LSI also helps search engines to determine the semantic relationships between two or more documents. Semantically close: When two documents have large number of common synonyms, similar phrases, phrase correlations, common entities with close proximity, then they are determined to be semantically close. Semantically distant: When two documents have few common words, synonyms, correlations, they are determined to be semantically distant. Based on these factors, a similarity value is calculated that helps Google to return the most relevant result to the query of the user. Likewise, search engines can determine whether the user’s search query and the documents are semantically close by looking at the common synonyms, context and related entities to that of query and the documents. The bottomline is that, if your webpage has synonyms, related words, entities related to the main keywords users are searching for, chances of your webpage ranking high for the keyword is higher. These keywords that you need to include in your webpage to get an LSI boost are called LSI keywords. These are some of the ways by which you can get LSI boost. Using LSI keywords and including relevant content to them. Making use of structured data in your blog posts for search engines to accurately determine the type of the webpage and entities present in your document. Answering all the possible questions users may be looking for when searching for a topic/keyword online. Optimizing the blog post for a whole topic (topical optimization) rather than for a specific keyword. You now know about LSI keywords. Now, you need to use these long tail keyword research tools to generate more keywords, to target in your main keyword. There are various tools like Google Suggest, Search Console, Semantic Link Search, Similar-word, Ultimate keyword hunter etc. Among the various tools available, the Google search is an excellent tool. All that matters is, you have to learn how to use it. Here’s the simplest way. You can find LSI keywords from search suggestions. And also from related searches at the bottom of the SERPs. If you are a regular follower of my blog, you already know that I highly advise you to do thorough competitor topic keyword research before even starting to write your article. This enables you to figure out what are the topics you need to cover in your article, keeping keywords in mind. Suppose if you are writing an article on “Blog traffic”, you need to open some top ranking competitor results. Now, you need to make use of Chrome extensions like Smart TOC or Table of contents sidebar to display the table of content of the page you are visiting. By looking at the table of content of some more thorough guides that are already ranking for your search term, you’ll get ideas about what to include in your article and also LSI keyword ideas that you need to use in the subheadings and content of the article. When you include this kind of LSI keywords in your subheadings and table of content, you’ll also get sitelinks in Google for those LSI keywords. That means, additional traffic from those sitelinks. Google search presents you the related search terms at the bottom of the search results when you make a particular query. In above example, I took “paleo diet” as my seed keyword. I searched for it in Google. Now Google presented me all LSI or related keywords to the main keyword. So if you are writing about Paleo diet in your blog, then including words like – meal, recipes, food, makes your content LSI-friendly. As you can notice above in the screenshot, you can easily find the related keywords to your main keyword in Google Auto Suggest. You can insert asterisks (*) symbol to fill in the blanks the Google suggest. You can also look at Google’s suggested related terms at the bottom of the SERP. Google search console displays you the keywords that are driving traffic to your site. Earlier, Google Analytics was displaying it. But, now search console is the only place where you can get keywords that are driving you traffic. To get the keywords that are driving you traffic, go to Search Console, and there head over to Search Traffic and Search Analytics. Take a popular blog post, now dig in the search analytics to come across what are all the related keywords that are driving traffic to the post alongside the main keyword. List the keywords that are driving traffic to your page inspite of you not targeting it. Now, go to your page, copy the main keyword you need to rank for. Now search for that keyword on Google. Browsing the top 5 SERP results for the main keyword, notice how often they’ve used the related/LSI keywords you found in the first step above. Tweak your post and add the necessary information along with the LSI keywords to increase your chances of outranking your competitors. Semantic link search is one of the greatest semantic research tools. For example, if the main target keyword for a blog post is “Semantics”, then you may have to enter it in the search box as shown below. Now, as you may have observed that the tool suggested related words like syntax, theoretic, RDF, lexical, semantic, syntactic, propositional. Look up for the meaning of the word for which you are not certain of. Now just scatter up the semantic keywords here and there in your content. By this Google clearly concludes that the post is about semantics. It’s the simplest and effective tool of all. You need to simply enter the main keyword in the search box. It will return the results in seconds. This tool may sometimes, generate irrelevant keywords. So, make sure that the words are semantically related to the main keyword and topic, before using it on your blog. It’s a unique LSI tool that I’ve ever used. It’s great. Just head over to UltimateKeywordHunter, enter the email to help them send you a copy. Go to your inbox and click on the download link. The setup file is just around 2MB. Install it. Enter the keyword for which you have to search for LSI keywords. Hit PARSE. Wait for the analysis to complete, and hit analysis report. The result will be opened. Basically, this report contains the most repeated semantic terms in Google top 10 results for the seed keyword. In the result, the stop words are excluded. So you will get rock solid semantic keywords. It’s one of the most powerful tools in my SEO arsenal. You can export the LSI keywords in the result as CSV file, and upload it in the keyword planner for search volumes and effectiveness, if you are really paranoid. Now, as you can see in the above result, if I sprinkle some semantic keywords like natural language, computer science, semantic elements and lexical in my blog post, I will get a ranking boost. With this, you can easily adapt the semantic strategies of the top contenders for the keyword in SERPs. These Related keywords are also called Related LSI Keywords (rLSI). Apart from Google search, you can also use the Google Keyword Planner. The goal is to note all the synonyms to your main focus keyword. Another tool that you may consider using to do the LSI keyword research is the best visual keyword research tool called – AnswerThePublic. It helps you easily make out relations with various entities and come up with less competitive LSI keywords you can target. You can also make use of a tool called LSIGraph. This is a tool that’s specially meant for LSI keywords research. Although there are many such tools, the fact that this tool is named after the buzz term “LSI keywords” contributes largely to it’s popularity in the SEO world. The results returned by the LSIGraph are LSI or related keywords. You can upload these keywords in the free bulk keyword volume checkers like KeywordsEverwhere to get an idea. There are various premium tools available to find the related keywords. Let’s see some of them like SEOPressor, Easy WP SEO, and SEMrush. SEOpressor comes packed with various killer SEO functionalities. It also suggests you LSI keywords using Google and Bing API. It helps in boosting the on page SEO of your site. Helps you rank for some more narrow search terms in Google. 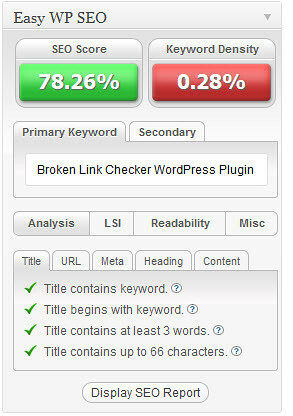 This is one of the greatest SEO plugins for WordPress. It lets you optimize your article effectively around your target keyword. It comes with functionalities for setting primary and secondary keywords for your articles. It also provides Copyscape support. Along with these, it also comes with tons of other features. For this tool to suggest you LSI keywords, you need to enter the Bing API key in settings. Including the LSI keywords that this plugin suggests you, helps in getting a boost in your rankings. It is basically a competitor keyword and backlink research tool. It has a plethora of features. Along with those, there are two main features called related keywords and related phrases report. Just enter the seed keyword in the search bar. Along with presenting the volume, CPC and other competitive data for the keyword, SEMrush also displays the related keywords. The great thing is that this tool also displays the search volume and CPC of the related LSI keywords. To view the complete report of related keywords you need the pro plan. Here’s another strategy I’m using right now. Once I come with a target keyword to create a blog post on, I’ll plug the keyword in Google search and take a note of the top 3 ranking pages for that keyword. Now I make use of tools like Ahrefs and SEMrush to know what are all the other related keywords that are driving traffic to these top 3 results. For example, if a site is ranking for the popular keyword – best turntables under $100, it will also be ranking well for best record player under 100, best budget turntable, best cheap turntable, topturntables under $100, best turntables below $100, and some other synonymous variations. The above mentioned tools like Ahrefs , will return all these keywords that are most of the times LSI keywords. You can use an SEO tool called Serpstat. It has 3 features that find LSI keywords: related keywords, search suggestions, search questions. Related keywords report shows keywords semantically related to your primary keyword. Search Suggestions are popular search queries that pop up under the search bar as you start typing your query. Search Questions are interrogative forms of search suggestions. While researching LSI keywords, knowing what of these keywords will make a difference to your rankings is a challenging task. That’s where you need to do the is use the TF-IDF concept. What the heck is TF-IDF? TF-IDF stands for term frequency-inverse document frequency. It is used by search engine algorithms to determine the relevancy of the web content for a specific query. The search engines treat those keywords that are present alongside the main keyword in many documents (that target the same main keyword) as related/LSI keywords. Along with this, search engines also learn how often a LSI keyword will ideally be present in document on a specific topic. There are free tools like Website Auditor from SEO Powersuite, that can help you do the TF-IDF analysis of top ranking websites. By doing this, you can know what LSI keywords your SERP competitors are using and how often. If it works for them, why not you? As you can see in the above screenshot, the tool has scraped the content from top 10 search results for the keyword – “LSI keywords”. It has made a huge list of multi word keywords and also single word keywords that appear prominently in the results. The frequency at which these terms appeared in the documents is referred to as TF-IDF. It also displays the TF-IDF of your page you want to semantically optimize for. You should always aim for reaching the average search results’ TF-IDF in the webpage you need to optimize. If you are witnessing a new keyword your competitors are using, but you have a TF-IDF score of 0 for that, then it means you need to consider updating your webpage and include the new concepts/keywords accordingly. Many newbies ask me, what keyword density is ideal for an article. But the answer is that the density of the keyword varies greatly depending upon the topic. So, the best bet for you is to take a look at what other blogs that are ranking high for the keyword is doing. Rather than stuffing the same keywords repeatedly in your articles, follow what’s working for others already. Rather than doing the LSI keyword addition after publishing your article, which is a real pain, do research beforehand. Before even starting to write an article, prepare a solid outline of the article. Along with the outline, research the main keyword and also the LSI keywords you need to include in the article using competitor keyword analysis. Adding the LSI keywords after publishing the article is quite irritating and as well inefficient job. Let me give an example. You are writing an article on Paleo . Your prime keyword would be “Recover from Google Panda Update”. After you write a post on this, make sure you include related terms like effect, SEO, Penguin Update, update, etc. in the post, it acts as a content relevancy signal. Google thinks that your post is about recovering from Panda animal attack. Avoid repetition of the same keyword over and over. As you can see in the above screenshot, Ankit in his post – Blogging Tips, has made clever use of LSI keywords for targeting the main keyword – “Blogging tips for beginners”. He made use of words like new bloggers, newbies, beginners, etc. LSI and other keywords follow some basic rules. You can include LSI keywords anywhere in the article. Below is the list in the order of priority. Here are some places where you can include them. Scatter throughout the blog post. ALT tags. Prevent ALT keyword stuffing by including semantic keywords. Using semantic keywords craft a new title for your blog post, and use that title in social media. Anchor text, as they should be diversified. However, do remember the keyword density. Gone are the days when Google was looking for the number of times a keyword is used in an article. Google needs to find content that’s contextually relevant, so it expects some keywords to be included in your content to ensure that it’s topically relevant. “Using LSI keywords in SEO-friendly and natural manner is better than using the same keyword often in your blog post”. As I said before, use related keywords only to signal content relevancy. Rather than using the same keywords repeatedly on your site, once you hit that keyword stuffing threshold, start including LSI keywords. With this, your content appears perfectly natural and as well optimized. If you are outsourcing your blog posts to a writer, make sure that you give him the list of LSI keywords along with the main keyword to use in the blog post. Set the clear expectations, by presenting him a complete outline of the blog post, keyword usage, and questions he need to answer in the blog post. Teaching your freelance writer about how to use these keywords in the article makes a great difference in the SEO traffic you get. In 2013, Google rolled out Hummingbird update. Some also call it as “Semantic Update”. This is an algorithmic update aimed at understanding the intent behind an users’ search query in a better way using semantic intelligence. Instead of making out the meaning of individual words in a query, it makes out the context and meaning of the whole query. This proved to be very helpful for Google to improve its voice search engine, results returned for new search queries, and much more. Once Google starts to know the particular intent behind a query tapping into its big database of entities, it started to expect some keywords in the webpages to make sure that they are relevant to the search query. In other words, prior to Hummingbird update, Google most of the times was matching just the entered keyword in the webpages and displaying them (that’s when keyword stuffing was abused a lot). After the update, Google started showing the relevant web-pages by understanding the intent of the keyword rather than just matching the keyword. This update impacted 90% of the search queries. After this update, some authority sites that did not have keywords present in the article but indeed are highly relevant to the search query started appearing on top. People who used to stuff keywords were the losers. After the HummingBird update, the term topical optimization came into picture over keyword optimization. Topical optimization refers to optimizing your article for a narrow topic than a particular keyword. For this you need to make use of LSI keywords and answer every possible question regarding the article you are writing about. LSI keywords when compared to the main keyword typically has low competition. Every blog has content that old and stale. Those blog posts that are getting little or no Google love. It’s time for you to show some life for those blog posts with some LSI magic. For this, you need to go to Google Search Console. Here you need to sort by descending order of impressions. As you can see in the above image, this very article is also appearing frequently for “LSI graph”. It is a tool for researching LSI keywords. If I include this tool frequently on the blog post, then I will rank higher. Another trick is to make use of SEMrush. Above are some of the LSI keywords for my main – “LSI keywords”, that I am ranking for in top 50. But, frequently using them in my post makes me gain some additional traffic. Like this, by making use of LSI keywords you can drive some additional traffic to your old blog posts that would otherwise drive you very low traffic. If you are doing PPC ads, don’t just target a single keyword. You can research good related keywords to your main keywords and increase the chances of lowering the costs and maximizing the visibility of your ads. LSI keywords when compared to the main keyword typically has low competition. So, the CPC will be low and you get good ROI for your advertising efforts. You need to think outside of the Google Keyword Planner, to truly find out the hidden gem keywords you can target. This strategy not only applies for Google Adwords. You can use the same in Bing Ads, Amazon ads, and all PPC networks. Sometimes, the combined traffic from these LSI keywords will be higher than that of main keyword with less CPC rate. If you stumble upon a keyword with high competition, research for LSI keywords and target them instead of the high competition keyword. In doing so, you need to ensure that the LSI keywords reflect the same intent of your ad. Or else, it’ll backfire. It’s been advised to use the keywords in your image name and alt tags. But do you know that by using the same keyword in all the images on my web pages I hurt my organic traffic? People often think that, if they stuff keywords in image alt tags and names, it’s ok. They also think that using the blog post title as alt text for all the images on a page is fine. But my experience tells me that alt tag keyword stuffing pushes your webpage to 8th or even 50th position that would otherwise deserve 2nd or 3rd position. Instead of using the main keyword, try to make use of LSI keywords in your image alt tags. Don’t use them if they are irrelevant to the image. Try to supplement them with image description. ALt text should be highly relevant to the image. Getting the exact-keyword anchor text backlinks helps you to rank. Google is frowning upon keyword-rich anchor texts lately. So, there are several fixes for this. If your backlinks’ anchor text are not too optimized, you significantly reduce the risk for penalty even if the backlinks are from low quality sites or a content farms. As an alternative to using main keyword as an anchor for all the backlinks you build, try to make use of LSI keyword anchor texts. Suppose you want to rank for “furnished apartments in seattle”, you can build backlinks with the following LSI-rich anchor texts. But still, keep the keyword anchor backlinks percentage below 30-40% in your backlink profile depending upon the quality of the sites you’re getting links from and also the niche. GREAT IDEAS THANKS A LOT FOR THE IDEA. I think I got what I was looking for. Thank you so much. Good explanation on LSI – Akshay. You have a fair point too. once you include terms like animal attack, white bear, it will mean that your post is about panda recovery.. i could not understand how? can you elaborate. It means that the blog post should have more related terms pertaining to the target keyword. Thanks for clear step by step discussion. I am writing a post and wanting to implement LSI keywords as I came to know that it is the better solution not to repeat the same keywords and as well as also helping to avoid Google Penalty. I have a question, as you mentioned I need to include LSI within title, but problem is I guess if I use my title would be looking long and wired. And I think the content body would be the best place to include LSI. Am I right? Thanks for such a great article. Was a bit confused about the use of “LSI” but now it would help me for getting my posts on google search results. Thanks for the great post Akshay. I understand the value of using Google Search and KW Planner to find LSI, but can you recommend any other free tools that maybe are more scalable, and can offer more related kws? Thanks in advance. Hey Jason, glad I helped you. I hope you do implement the strategies that I’ve mentioned. Terrific amount of information for LSI. Great blog. Thanks Akshay. No doubt, LSI is a powerful factor of SEO. i really admire how you present all the techniques in this article and made it worth to read. thank you! You have made it very easy with screenshots & explanations. As per the recommendations, we need to keep the keyword density to around 1.5%, which seems very low. So here comes the usefulness of LSI. These related keywords can give significant SEO benefits to the post. LSI keywords density of 1.5 % may appear too low. But it really depends on the topic you are writing about. And yes, it boosts SEO greatly. Now I get the point that why LSI keywords are so important for better SEO experience. Thanks for sharing such a great blog with us. Using exact keywords multiple times does not only tell search engines that you’re pushing specific keywords but users reading the article can sense that there’s something on a post. Aside from it doesn’t look natural, it also sends signal that an article is poorly written because similar words are being overused. LSI does legit website owners a favor, it makes them an authority in their industry. Awesome insights to LSI keywords. I recently came across one LSI keyword generator called “LSIGraph”. I’m quite new to this, but it does feel like a nifty tool for me, what do you think Akshay? Are the suggested keywords LSI Keywords? Thanks for the information! It was really great reading this article- it was so clean and informative. Thanks again! Your posts are AWESOME – THANK YOU! I’m a newbie here. My site is “under construction”, but I write web content freelance and web design. This will be my “go to” site for info. I am about to look for any posts you may have on how many LSI’s to use, how many other synonyms, etc. I received instructions to use a max of 3 LSI’s plus synonyms related to topic of article. My articles are anywhere from 500-1000 words each. Thanks for your help by giving information. You have written awesome article on LSI keyword which is more much more in-depth than I have ever read. I would definitely follow what you said in this article. I hope It will help me to target the right keywords. Just some clarification to make sure I understand. Google will penalize you for stuffing even with the LSI keywords? So, be careful not to over optimize with the LSI keywords as well as the main keywords? Thanks again and look forward to hearing you response! Akshay Good and easy to understand post and also good that you updated a post and input some great new stuff and now google is rewarding you and showing your page on top of some big players. Utilizing LSI cleverly and properly always give good results I personally experience this many times. I believe LSI graph and Ubersugest also are good tools for finding LSI keywords. Both are free tools. What is you opinion on this when compared to SEOpressor? Thanks Akshay for LSI Keyword understanding. Good to see people like you are giving time to provide information. I will try to implement LSI Keywords in my sites. Thanks for these great tips on LSI Keywords – It is def an interesting way to get top rankings and such! Nice trips on LSI keywords. Any free tools similar to SEOPressor available ? Nice piece of writing Akshay. Very informative. First of all like to thanks Akshay for writing this helping article. I implemented some how LSI Keywords on my site and found it is use full. My site niche is different but still LSI works on it. I got my blog ranked on first page with the help of Akshay article. I defiantly like to recommend everyone to read carefully what Akshay wrote and try to implement it. Thanks a lot for valuable information on LSI keywords. Thanks for your help by giving valuable information. Didn’t know much about LSI Keywords. You have done a great job by sharing this type of article. I had some problem that I couldn’t find LSI keywords. But Now I know how to do it? LSI keywords are really important to boost your page rank. When focus keywords do not work perfectly then LSI keywords will come to the point. I am grateful to you for this article. Thanks for sharing. Thanks for sharing great article Bro. I really don’t know about LSI keywords till know. This article helps me a lot. What an amazing and well written article.What is you opinion on this when compared to SEOpressor? Thanks for great article. I already use SEO Pressor, very helpful plugin. Thanks to share with us I never knew that finding LSI keywords are really simple. Thanks for sharing such deep researched information. Really impressive Thanks for these great tips on LSI Keywords – It is def an interesting way to get top ranking in my website…. I have seen every pro blogger is talking about using LSI keywords but nobody has shared such a detailed article like this one. Great job I must say. I think using LSI keywords in our content helps us in lots of ways but do you think using them in our headings will have any extra benefit than placing them normally where they fit in the content ? Hey Akshay, Thanx for sharing this article. It would be great if you may answer my doubt. My doubt is ” what should be the density of LSI keywords in a 1000 words article?? Thanks for great article. I already use SEOPressor, very helpful plugin. Hello there! Your post is one of the best illustrated post. Maybe that’s why it’s ranked one in google for the term lsi. great post… well explained.. i am a beginner blogger .. i have a question.. will you suggest some LSI generator sites which are FREE? is there any option in the google keyword planner to generate LSI ??? Great ideas ….Very nice post. Thanks for the valuable information Akshay. Sir really Liked your article. It was awesome to read and feeling very calm and cool as I was upset with my blog’s progress. Sir I want to know that how many LSI keywords should we use in a post. Please tell me sir. Nice Article Very Helpful! Thanks for sharing! I don’t understant full article. Plz wil you tell me in short with some another examples. It will be very helpful for digital marketer like me. I will be waiting for your next post like this. There is another free tool, SemanticJuice which also works on vector spaces..
It’s a nice article and it help me alot, Thanks for the sharing this article. Keep writing. I just wanted to reach out and say “thanks” for mentioning (shouterspeak-bloggers passion )in your article. LSI graph/keywords definitely helps to increase search presence in SERPs. And of course, it is one of the proven strategy to include LSI keywords in an article or web pages. I have tried this a month ago and i have seen some better results to one of my articles. Whatever we write it must add some value to the readers. We must carefully include the keywords so that our article does not seems to appear as a keyword stuffing. You’ve mentioned the very useful tips here. Many thanks, Great work Akshay! Thanks, Akshay for your article on LSI keywords. It is important to be aware of what are the LSI keywords on the topic, but I feel it shouldn’t be just the main focus.